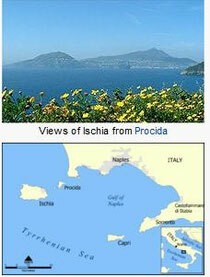 Ischia is a volcanic island in the Tyrrhenian Sea. It lies at the northern end of the Gulf of Naples, about 30 km from the city of Naples. It is almost entirely mountainous, the highest peak Mount Epomeo 788 m. Population of over 60,000 people. The main industry is tourism, centering on thermal spas that cater mostly to European (especially German) and Asian tourists eager to enjoy the fruits of the island's natural volcanic activity, its thermal hot springs, and its volcanic mud.